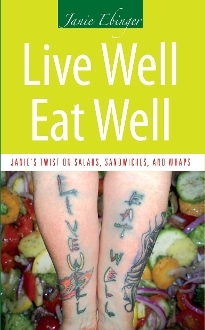 Once again, Janie Ebinger takes her readers on a journey with her newest cookbook, Live Well, Eat Well: Janie’s Twist of Salads, Sandwiches, & Wraps. This time, she includes recipes and tips for buffet salads, delectable sandwiches, and savory wraps. In her third book, Janie focuses on creating buffet salads for large & small parties, along with recipes for sandwiches and wraps for as few as 2 people or a whole bunch. Her twist? Each type of recipe can be made into one of the others—salads into sandwiches, and sandwiches into wraps, etc. She even includes some familiar vinaigrette and dressing recipes from her cookbooks Simply Vinaigrettes and Janie’s Simply Entrée Salads for Two. Her recipes promote the use of fresh and organic ingredients where possible to help you Live Well, Eat Well. With her wonderful charm and wit, Janie will inspire you to begin creating and cooking wonderful new salads, sandwiches, and wraps.